A few months ago, we heard from a frustrated reader. Noting the abundant info about emerald ash borer (EAB) in urban environments, he could find almost nothing on managing ash in woodland stands. Philip Potyondy created this video to begin to answer that question. First Extension’s Jeff Hahn reviews basic EAB biology, dispersal, and impacts on host trees. Second, Keith Jacobson of the MN DNR’s Utilization & Marketing unit briefly reviews markets for ash wood in Minnesota. Third, we head to the woods for brief comments from Paul Dickson, president of the Minnesota Association of Consulting Foresters. We close with a summary of research and management recommendations for woodland ash stands from Extension’s Angela Gupta. Special thanks to Jeff Hahn, Keith Jacobson, Paul Dickson, and Angela Gupta for their contributions to this video. You can learn much more about EAB in Minnesota at the UMN Extension EAB page. What are you doing to prepare your woods for EAB? Leave a comment to let us know. 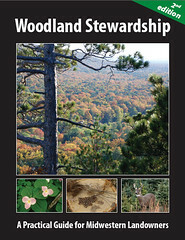 Woodland Stewardship: A Practical Guide for Midwestern Landowners, 2nd Edition was published by the University of Minnesota Extension for use by private woodland owners in the Upper Midwest. Managing forests to benefit wildlife. Designing and building recreational trails. Handling the financial considerations of forest ownership. Decisions by family forest landowners have the potential to affect a woodland for a century or more. Reading Woodland Stewardship: A Practical Guide for Midwestern Landowners, 2nd Edition can help ensure their decisions are the right ones for the family and the woodland. You can order the book here. Volume discounts apply: 1 – 24 copies cost $16 + shipping. 25 – 999 copies: $10 + shipping, and 1,000 or more are only $7 each. Prices exclude shipping. The University of Minnesota also was recently approved to receive a grant from the U.S. Forest Service, through the Minnesota DNR, to place this book on the Web, create a Web-based shortcourse around its content, and to evaluate the book and shortcourse. Providing the book in alternative formats will help ensure that its content is available to landowners in a variety of formats that meet their different learning styles. These other formats will be available in a year, but a printed book will meet the needs of most landowners. Like the idea of Community Supported Agriculture? Looking for ways to make a few bucks from your woodland? A Wisconsin family is trying Community Supported Forestry. This is a pretty interesting idea: For an annual payment of $550, Roald Gundersen and Amelia Baxter of Hamburg, WI are offering unlimited access to their 140-acre wooded valley south of LaCrosse. Four of 20 spots have already sold. Read more about their operation on their website. More information is available on the Worldchanging blog and in this story from the LaCrosse Tribune. As noted in a comment on this post, the concept is not entirely new: Woodland owners have been selling hunting leases, particularly in the southern US, for many years. But this is a new twist on the concept. The Community Supported Forestry concept is best described here by Vermont Family Forests. Timber Tax Management for Family Forest Owners is written for woodland owners and tax professionals. It provides more than a description of how to file after you have a timber sale. It provides an overview of the tax code that pertains to timber sales and the operation of a woodland as a business. It covers acquisitions, how to structure the acquisition, record keeping, reforestation expenses, management and operating expenses, timber sales, casualty losses, land sales, and exchanges. The conclusion is an in-depth treatment of Form T. The book will help landowners answer questions about the legal and financial aspects of ownership. Landowners and those who are likely to purchase or inherit woodland should read this book. It provides a step by step decision process for operation of the land as a business. The authors state on page 27 that one of the differences between a personal use activity and a business is, “The willingness of an owner to undertake an activity for profit. Owners not willing to do the record keeping should treat their activity as a personal use activity.” This clear statement and others throughout the book will help landowners, accountants and other tax professionals make decisions regarding the operation of their forestland. This announcement is reprinted from the March 12, 2009 Community Forestry Resource Center weekly news and event summary. The CVal spreadsheet is a powerful tool that will help foresters, managers, and project developers work with private forest landowners to assess the economic profitability of participating in carbon markets. CVal provides a discounted cash flow analysis based on a full accounting of variables, including tract size, carbon sequestration rate, carbon price, and enrollment and trading costs. Automated, financial break-even analyses in the macros version quickly assess threshold values of key variables for profitable projects, and the program readily performs “what if” calculations after storing starting values. CVal was designed to evaluate managed forest and afforestation projects traded on the Chicago Climate Exchange, but its methodology could be adapted for other trading mechanisms and agricultural sequestration projects. Documentation is provided in the program itself and in GTR-180. 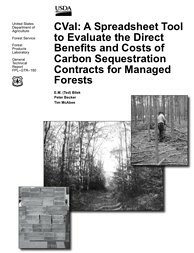 CVal was developed by Ted Bilek (USFS Forest Products Lab), Peter Becker (Eastern Ozarks Forestry Council), and Tim McAbee (LandMark Systems), and is available at no cost. Download CVal and GTR-180 here.